Other than golf, are there any sports where such a sustained period of good play can be so utterly ruined by a split second of ineptitude? On Wednesday the Alliance travelled to Peterhead for its second meeting of 2009. Jutting into the North Sea on Aberdeenshire’s north eastern edge, it’s a famously breezy place. In fact, the highest wind speeds ever measured on mainland Britain were recorded just up the coast from Peterhead in 1989 – 140mph. I think that’s about a 12-club wind. So, we were taken aback upon arriving at Peterhead GC to find there was barely a breath. It was about ten degrees centigrade and the sun was just appearing from behind a cloud. Given it had been below freezing at my house, I’d massively over-prepared for the expedition. My outfit consisted of long johns under corduroy trousers, three jumpers, hand-warmers, a woolly hat and gloves. My getup would have been suitable had we travelled to the Cairngorms and attempted an ascent of Ben Macdui, not quite so appropriate for a balmy day by the seaside. Already perspiring slightly, I made my way to the first tee where Stewart and I met our partner for the round – Philip McLean. He’s quite good. In fact, he’s 586th in the World Amateur Golf Rankings and reached the quarter-finals of the Argentinian Amateur Championship just before Christmas. So we were interested to see how our games would shape up against his – not too well was the ultimate answer. Having said this, I was going along nicely for quite some time. I was out in 36 – just one worse than Philip – and made steady pars on the first three holes of the back nine. I’d put in two hours of solid play. Then, on the 13th tee, I hit a pull-hook into some knee high rough – lost ball. One nanosecond of poor golf after two hours of good golf and my score went west. This was the reason for my opening question. There’s just no margin for error in golf. In tennis, one bad shot means you lose the point – no great catastrophe in the grand scheme of the match. In football a mis-hit shot might fly wide of the target – hardly a disaster. But, in golf, one minor error can render four hours of intense effort completely futile. 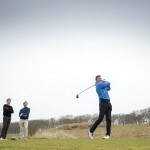 I dropped five shots over the last six at Peterhead to finish with a 75 – eight behind Philip’s winning score of 67. I was also beaten by Stu’s 73 so lost the fivers again. I’m going to have to start asking for shots. People who know me or who’ve read anything I’ve written about my golf will know that, short of criminal activity, I’ll do pretty much anything to improve my game and lower my handicap. With this in mind I’m about to trial an online coaching site – golfmindfactor.com It’s by Dr Karl Morris – a leading mind coach who works with Lee Westwood and Graeme McDowell among others. I haven’t begun yet, but I’d imagine I’m the perfect test subject. Few golfers have such a diverse and terrifying array of demons loitering with intent in the dark recesses of their minds. If this programme can cure the psychological problems of a man who experiences an average of 19 major mood swings per round then it will be good. I’ll let you know here, or perhaps in the magazine, how I get on. Oh, my first question. I’ve been thinking about it while writing this and the answer is – yes. Lewis Hamilton could lead a Grand Prix from pole position before crashing on the final bend. Bode Miller could be obliterating the opposition down the Lauberhorn before missing a gate on the final schuss. The most awful one I can think of would be in the Tour de France – Axle Grannycog, or whoever, could take the yellow jersey in the prologue time-trial and hold on to it for three weeks over the Alps, across the Pyrenees, enduring intense physical pain while spending six hours a day in the saddle. Then he could get a puncture on the final stage into Paris, fail to catch up with the Peloton and end up losing by 10 seconds. No, we golfers don’t have it so bad really.